Is tire mulch a safe covering for Los Osos playground? 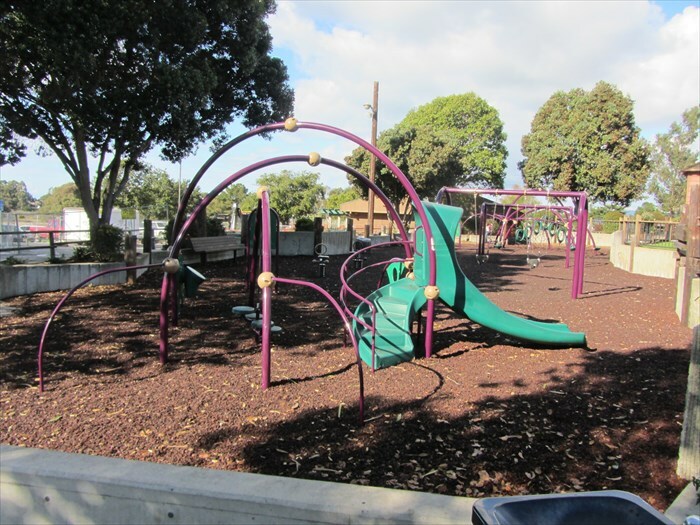 A few years ago San Luis Obispo County Parks replaced the playground equipment at our one and only park here in Los Osos. When they did, they also installed 240 yards of repurposed shredded tire mulch underneath it. This black rubber material apparently meets safety standards for impact, lessening the chance of getting hurt in a playground fall, but does it meet the standards of our community? The material reeks of petroleum, on any given day the off gassing is noxious. The children come out of the area covered in dirty residue and the material’s jagged edges make it easy to cling to clothing and shoes so it tracks out all over the park, parking lot, into the street and into our watershed. The internet is filled with frightening stories that speak to the materials potential health risks and carcinogens. We have found pieces of it in our house when it has hitch-hiked its way home — stuck to my child’s clothing. His face and hands grayed with soot each time he returns from playing there. Families don’t play at this park like they used to and the complaints continue. I reached out to SLO County Parks soon after the material was installed some years ago. I was informed it had a lifespan of about 10 years, so here we are, somewhere in the middle of that lifespan and the nuisance that it has become outweighs any reason for seeing it through its life. Parks has told me, and others who have asked, that replacement is not scheduled until 2023. When the SLO County Board of Supervisors was asked to prioritize it for replacement in recent budget approvals, this approximately $20,000 expense was ignored. Residents have turned to the Los Osos Community Services District to see what they could do. The district has a pot of money (formerly known as “Pool Funds”) that it may be willing to tap to cover the cost of replacing the shredded tire material as soon as this fall. While I can embrace the district’s willingness to step up, I am outraged that the county won’t take responsibility and pay to clean up their mess. Bruce Gibson, District 2 supervisor could, and should, contribute from his discretionary funds to the fix — now. Julie Tacker is a 47 year resident of Los Osos and the mother of four. Cal Poly has similar stuff mixed in the AstroTurf to help with knee injuries etc. It is a same logic to put it in Parks. So it is in high use nationwide. If you are correct about the hazardous, Prop 65 banned, chemicals then there will be lawsuits-eventually. In the short run the County is more concerned about getting sued by a parent of a kid who injures himself than their long term health hazards. Tack 10 cents onto everyone’s sewer bill and you got it covered. Then again, if history serves as any guide, anything sewer related would lead to 20 years or more of community related dysfunctional discourse. In that time the County will have replaced it in Los Osos—and probably the 10 other county Parks that have the same costly issue. Perhaps the entire cost, not just Los Osos’s, exceeds the level allowed in a discretionary fund. Did you ask the County if there are other sites when you contacted them? Why don’t you add 30 cents to pave your own roads while you’re at it. You can lose your a car in the LO potholes. So tires and children hmmm. Are there no Prop 65 notices to warn parents? Besides that, air quality and fire safety are two good reasons to remove the chips. The pool fund is just that, for the pool to come. If misappropriation of funds is ok then maybe your pension check can fund water and green grass. In twenty years no one will be able to believe that someone would actually put this stuff into an environment that humans, especially children would habitate. Ms Tacker’s question is a good one…likely the recycled tires are messy, smelly but there are NO scientific studies to support harm to anyone. There are no objectively reported victims. That doesn’t mean that there are not chemicals in there that could be an issue with prolonged exposure, but it’s all a matter of persistent exposure. I would imagine that there is much more harm in drinking ground water out of Los Osos, smelling the fumes at the gas station, carcinogens released with barbecuing over wood or briquets. On this , i don’t fault Gibson. I would empower the community to replace the mulch with their own voluntary efforts/fundraising/volunteer labor. Wrong! California did it’s own scientific study years back (2007), Yale did another in 2015, and those are just the studies done here in America. The conclusion by all was “that a single incident of eating or touching tire shreds would probably not harm a child’s health, but repeated or long-term exposure might.” Also here’s something else that you’d probably find interesting; in that 2007 study where they compared the safety value of these tires chips compared to wood chips, wood chips were found to be safer in almost every case. I agree with Mrs. Julie Tacker! It is utterly outrageous that SLO Supervisor Bruce Gibson has not stepped in to craft a solution, and if he will not lead, voters must dump him from his cushy job representing us. Using recycled tires in a children’s playground is foolish, and all the politicians who embraced this stupidity ought to be hammered as well. The sky is falling. The sky is falling.